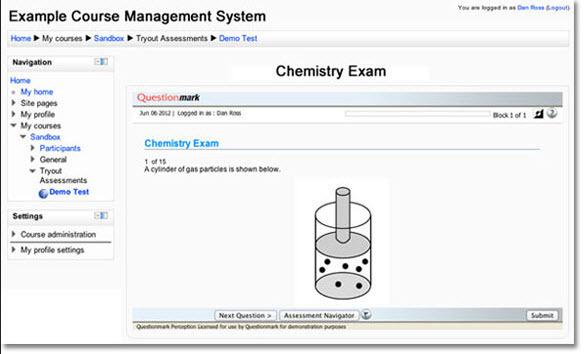 Integrating your LMS with Questionmark OnDemand just got easier! Last year I wrote about the impact that the IMS LTI standard could have on the way people integrate their LMS with external tools. I’m pleased to say that we have just released our own LTI Connector for Questionmark OnDemand. The connector makes it easy to integrate your LMS with your Questionmark repository. Just enter some security credentials to set up the trusted relationships and your instructors are ready to start embedding assessments directly into the learning experience. By using a standard, the LTI connector enables a wide range of LMSs to be integrated in the same way. Many of them have LTI support built in directly too, so you won’t have to install additional software or request optional plugins from your LMS hosting provider. You can read more about how to use the LTI connector with Questionmark OnDemand on our website: Questionmark Connectors. You can also find out which tools are currently supporting the LTI standard from the IMS Conformance Certification page (which we hope to be joining shortly). The LTI standard, in many ways, does a similar job to the older SCORM and AICC standards. It provides a mechanism for an LMS to launch a student into an activity and for that activity to pass performance information (outcomes) back to the LMS to be recorded in their learning record. Both the SCORM and AICC standards were designed with content portability in mind, before the Web became established. As a result, they defined the concept of a package of content that has to be published and ‘physically’ moved to the LMS to be run. The LMS became a player of the content. Contrast this approach with that of IMS LTI. In LTI, the activity is provided by an external Tool Provider. The Tool Provider is hosted on the web and is identified by a simple URL; there is no publishing required! When the Tool’s URL is placed into the LMS, along with appropriate security credentials, the link is made. Now the student just follows an embedded link to the Tool Provider’s website where they interact with the activity directly. The two websites communicate via web services (much like AICC) to pass back information about outcomes. The result is simpler and more secure! It is no wonder that the LTI specification has been adopted so quickly by the community.